Designing a "Banner for Today"
In June, the children of Parkside Infant School worked with artists from the Bear Park Artists Cooperative to design and assist in the painting of a "Banner for Today" which they would carry through Seaham and into Durham at Durham Miners Gala on 10th July 2004. The timetable for this work was extremely tight and could only be achieved if everyone involved worked together and worked very hard. The work was done outside of normal school time with Head Teacher, Mrs Harwood, giving up holiday to be with the children. Two artists, Barry and Jon, led the children through the process of developing ideas, designing a front and back for the banner, painting a background on the canvas and painting selected items on to the banner. The children took it in turns to be involved. Their concentration was impressive. The two canvasses (back and front) were then taken to the artists studio to be completed. When completed, the canvasses then needed to be sewn together and trimming added to produce the final "Banner for Today". 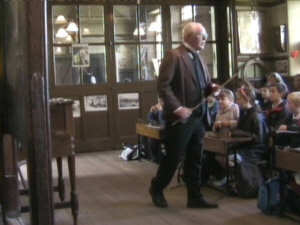 On the morning of the 30th June 2004 a party of children from Parkside Infant School set out to visit Beamish Museum to discover first hand what everyday life was like in a traditional Durham mining community. These children live in a former mining community which boasted three deep coal mines yet neither they nor their parents have ever worked down a coal mine. That is the amazing fact which is driving SDVT Banner Fund to support this project. No new employees were taken on at the pits after about 1980, which was one of the main reasons why the Great Miners Strike of 1984 took place. The government of the day was gradually "winding down" the pits. By 1992 Seaham three collieries were essentially closed. ALL of the children of Parkside Infant School were born after that date!